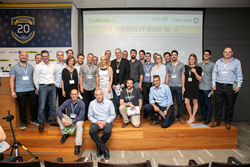 The Marker, Israel’s leading business publication, has named Pixellot one of Israel’s Top 20 Startups in its inaugural annual list of startups. Pixellot is the global leader in automated sports production technology delivering a comprehensive TV-like experience from live viewing to highlight reels. The system is easily installed in athletic facilities around the world, from the highest levels of professional sports to the lower leagues, as well as niche sports that were previously underrepresented in terms of availability, especially on the women’s, amateur, and semi-professional levels. The system is specially tuned for more than 10 types of sports including soccer, football, basketball, hockey and volleyball. The automated production technology also powers the Pixellot video coaching system, which is deployed by top clubs in Spain, Germany, England, and China to boost player and team performance. The tech generates high-quality panoramic footage of the playing field and follows the action on the ground, simulating a virtual camera operator using computer-vision AI algorithms. The footage is automatically streamed via Pixellot’s cloud to fans, family, coaches, and scouts on all platforms. To augment the video and create an enriched viewing experience Pixellot’s feed comes with a myriad of production modules, including game clock, scoreboards, high-end graphics, automatic highlights, editing tools, and a play-by-play commentator. The prestigious recognition was awarded by a committee of journalists and columnists from The Marker, a Haaretz-group owned business magazine. “We are honored to be recognized by The Marker as one of Israel’s Top 20 Startups,” says Alon Werber, CEO of Pixellot. “This is a testament to the hard work and commitment of our employees around the world. We’re all passionate about sports and know that you can only win when your team works together and supports each other. More than 2,500 Pixellot systems were sold worldwide, broadcasting more than 17,000 hours of sports monthly in countries like the United States, Canada, China, Germany, Spain, Austria, Netherlands, United Kingdom, Japan, and Mexico. Most recently, Pixellot announced that the Mexican Soccer Federation has deployed its solution in every Liga MX soccer stadium in Mexico to produce all league games for video coaching.